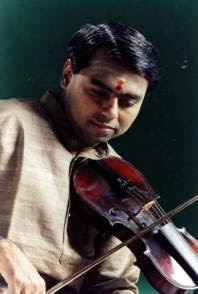 SanKritiLaya is pleased to announce their Fall 2009 classical instrumental concert tour by R.K. Sriramkumar. The schedules for this tour as well as Hyderabad Brothers' tour will be announced shortly. R K Shriramkumar belongs to the Rudrapatnam family of musicians, a family with a glorious musical tradition. He is the grandson of the much respected Vidvan Shri R K Venkatarama Shastri. Having had his initial lessons in violin playing from Vidushi Smt Savitri Satyamurthy, Shriramkumar was trained by his grandfather Shri R K Venkatarama Shastry. He later received guidance from Vidvan Shri V V Subrahmanyam and also had training in vocal music from Sangita Kalanidhi Shri D K Jayaraman. His skills were further honed through the association and learning he gained by accompanying the doyens of Carnatic music like Sangita Kalanidhis Shri Semmangudi Srinivasa Iyer, Smt M S Subbulakshmi, Smt D K Pattammal, Shri D K Jayaraman, Shri Palghat K V Narayanaswamy, Smt T Brinda and others. Shriramkumar has provided violin accompaniment in several commercial recordings and has had the blessed opportunity of participating in a very unique recording entitled ‘Divine Unison’ featuring the great veterans Shri Semmangudi Srinivasa Iyer and Smt M S Subbulakshmi. A recipient of many awards, Shriramkumar has traveled far and wide on concert tours. He also directed the music for a special television presentation on the Sringeri Sharada Peetam and has set to music a few compositions of the Acharyas of the Sharada Peetam. K. Arun Prakash is a dynamic young Mridangist who hails from a musical family. He is the son of Shri L. Krishnan, a composer. He started learning Mridangam from the age of nine under the late Sri Ramanathapuram M. N. Kandaswamy (a disciple of Palani Subramania Pillai). Arun Prakash has performed in all leading music Sabhas and over the years has accompanied famed artists like D. K. Pattammal, K. V. Narayanaswamy, D. K. Jayaraman, T. N. Seshagopalan and U. Srinivas. 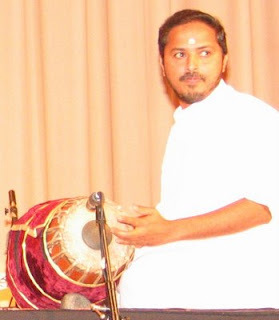 Arun Prakash has won many awards for his Mridangam playing and has performed in USA, Canada, Middle East and U. K.
Guru Prasad is a dynamic young Ghatam percussionist who has built a reputation as a front-line accompanist in the Carnatic Music community in India. He is much sought after and is a strong support percussionist in many performances with the top carnatic musicians. Can you please give the info on the venues where Shriramkumar is playing? RKS is a brilliant violinist, and I always have enjoyed it when he has accompanied vocal artists. Listening to him as a soloist, I found the concert very interesting. The ragas were rather short in length, but that is probably because there is no pause (for a second violinist) between phrases. He played several of my favourite songs in Detroit, but I wished I could hear the words. So, perhaps the songs that work in a vocal concert don't 'click' in a violin solo concert... The most enjoyable pieces were an outstanding Brindavana Saranga (Soundararajam/ Dikshitar) and the listener requests. I kept wishing for some well-known Thyagarajar songs. That might obviate the need to announce the pieces (a trifle annoying). Arun Prakash & Guru Prasad were great, and this set has 'set'. Please do more solo tours RKS - very enjoyable.